The Batish Institute Indian music activity started in the U.S. started around 1970. These music archives will direct you to our learning centers on the Internet where we have stored our music and arts information. New information is added daily. 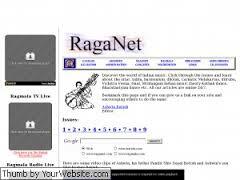 RagaNet is the creation of Ashwin Batish. It is dedicated to educating its readers on the music and fine arts of India. Here you will also find lessons on the sitar, tabla, on history of Indian music, raga theory, learning ragas. Midi, and mp3 files are included where necessary.